← Does Scottish Football have an unlikely saviour? With the falling of 3 inches of snow in around half an hour last Saturday, my weekend’s entertainment was obliterated. First, my hotly anticipated game of seven aside was cancelled and then Arsenal Stoke as well as most of the rest of the Premier League schedule was scratched. The reason behind all these cancellations – including my own game in North London – was health and safety concerns for the staff and spectators attending the match. Seemingly the only pitch that was unplayable was at Blackpool, who are the only club not to have under-soil heating. 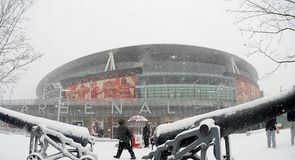 The idea behind these health and safety concerns is that fans are more likely, when there is snow, to have an accident either on the way to the ground or on the steps and forecourt around the ground. A Liverpool spokesperson explained after the game there against Fulham was put off “The safety of all fans attending the game is paramount and although the Anfield pitch is playable, the conditions around the stadium and further afield for people travelling to the match are such that the decision was taken, following Police advice on safety grounds, to postpone the game”. This of course invoked the usual response about how we have all gone soft and that the players of old would one have been out there shovelling snow before the game and then played through a blizzard with an orange ball. There have of course also been conspiracy theories associated with the postponements. Probabaly the most controversial of the decisions was that at Stamford Bridge to cancel the weekend’s headlining fixture between Chelsea and Manchester United a full 27 hours before kick-off. Rio Ferdinand said on Twitter apparently questioning the decision “Did anyone see the Ipswich game? 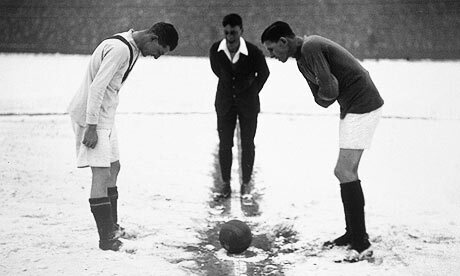 Pitch covered in snow….so how come that game is played and ours is postponed?” and there have been suggestions that it was in the interests of Chelsea, who are not in the best of form, to have this game delayed. One commentator did explain rather humorously though that the journey from Kent for the away fans was rather treacherous at present. I think there are two points that must be remembered before we vilify the clubs and councils too much for these decisions. Firstly, this is arguably the worst winter weather we have encountered for three decades. Councils have become used, especially in the south, to not having to worry about huge amounts of snow. Admittedly last year was much of the same and you could argue that that should have prepared them but given that they are stretched I am not sure the clearing of roads around Premiership grounds should be considered a priority. Football games put a strain on certain parts of the transport system at the best of times and under these trying circumstances it is probably for the best that these games were cancelled. We are not going to miss out in the long run, they will be rearranged. The other point relates more to the health and safety around the grounds. This is of course being seen as further evidence of the ‘nanny state’ but unfortunately this is a situation we have created for ourselves through our recent propensity to sue when we have an accident and the groups like ‘The Accident Helpline’ who oil the wheels and promote the whole affair with their promises of giant cheques worth thousands of pounds. Last year Rob Elvin, the head of the safety, health and environment group at the law firm Hammonds gave an interview to The Times following the Premier League postponements last year and explained far better than I could. “A football club has duties, like any company, to not expose employees or members of the public to health and safety risks. “If you know people’s journeys are going to be treacherous, then arguably the match would be the cause of any accidents. You’re creating greater risk by putting the match on. Clubs could leave themselves exposed to criminal proceedings if they fail to act on the advice of police or local authorities. Club’s can surely not be blamed for protecting themselves. The last thing they want is a spate of injuries resulting in payouts on their criminal negligence. Like it or not clubs are now under an obligation to cancel these matches if they see any substantial danger that could come to people under their responsibility. And if that results in less accidents and less petty claims for cash then I am all for it. This entry was posted in Football and tagged Football, health and safety, postponed matches, premier league, rio ferdinand, snow. Bookmark the permalink. How many spectators were due at your 7-aside games?